This is another mare from Slängsboda, Basetla. She is a rare Banat daughter out of the beautiful Czort daughter Basn. She has left very good offspring, among them Bernatka owned by Q-Arabians and Benina by Om El Tanam. Her damline is Semrie OA, imported in 1902 to Babolna. Both Semrie's dam- and sireline was Kuhailan. This family came to Poland as spoils of war. The Germans had collected horses from all occupied countries to form a "superstud". When the war ended the Allied divided the horses between them, some going to the US (they were taken, NOT exported!) among them *Iwonka III, dam of Balalajka. In 1951 the Babolna mares were sent back to Hungary as the recovery agreement stipulated but only after founding valuble families in Poland. This family existed in Poland before the war, through the stallion Kuhailan Said imp 1937 and the mare Koheil-Semrie imp 1929. Neither survived the war, Kuhailan Said was taken to USSR and Koheil-Semrie was lost. After the war three branches were established, through Baza, Brda and Bojazn. All branches have left valuble horses. From the branch of Baza comes the stallions Czardasz, Branibor, *Bajdak, Baj and *Barbaados and the mares Basn (dam of Basetla), *Bajkaa, Bajra imp SWE and Bajdea imp SWE (dam of Bajano). 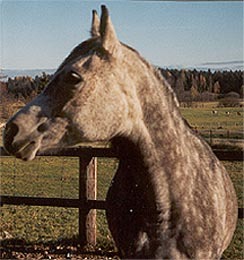 Baza's full brother Kuhailan Abu Urkub was also used in Poland and is the sire of Forta and Ferha. The family of Brda is continued through Darda (dam of Dardir imp SWE) and her daughters *Druchnaa, *Dornaba and *Dratwa. Stallions that belongs to this branch are the aforementioned Dardir, *Doman imp SWE, Arax, *Druzba, *Deficyt, Danser imp SWE, *Druch, *Dar, Diagram and Drabik (leased to Sweden). Bojazn didn't leave any female family but three stallions descend from this family. Bojazn's son Duch by Wielki Szlem was used in Poland but the most important stallion was her grandson *Bibars, out of Bojkena. He was discovered by Mrs Griesbach of the Achental Stud in Germany. He was used on mares of Weil/Marbach lines and mares of Babolna breeding. After leaving valuble offspring in Germany, he went to Argentina and Mrs Griesbach's daughter's farm. He went back to Europe and was at stud at Blommeröd in Sweden for one season before being exported to Tom Chauncey, USA. Bojkena's other son Borys by Wielki Szlem was also owned by Mrs Griesbach. He gave only four mares but they included the valuble mare Ruanda.